I was involved in a serious accident on August 1, 2008 which left me hospitalized for 30 days, in a wheelchair for 60 days and living in a hospital bed in my parents dining room, all to help save my leg, which had a Tibial Plataea fracture and external femur fracture. I took my first steps post-accident on November 4, 2008! I also had a humorous fracture, which left me with limited movement in my arm and hand. Recovering from the accident took about 10 months of physical therapy to regain my strength and movement. I will never have full range of motion in my leg, but I manage just fine. Following all of this, I was just happy to be up and moving around that I never really thought about trying to get myself into any type of physical shape. Then I got married, pregnant and had a beautiful little girl born in June 2011. I dropped the baby weight quickly, but as my daughter got older I realized I was in no physical shape to keep up with her on a daily basis. In January 2015 I finally decided to take my life back and make a commitment to my well-being. I started working out 2 days a week at the gym, and by April I was hooked! I found that by getting up early in the morning, I was able to work out, feel great all day and have the energy to keep up with my now 3.5 year old. I started to watch what I was eating, although I do not really deny myself anything, I am just more aware of what I eat, and started to notice results. I have never been “overweight” but I have carried extra pounds and have been severely out of physical shape. Once I started working out on a routine that fit my schedule I started to notice changes… stamina, energy, muscle tone! I was reaching the point that the weather was getting nice and I wanted to do more outside, that is when I heard about ThankDog! Bootcamp. 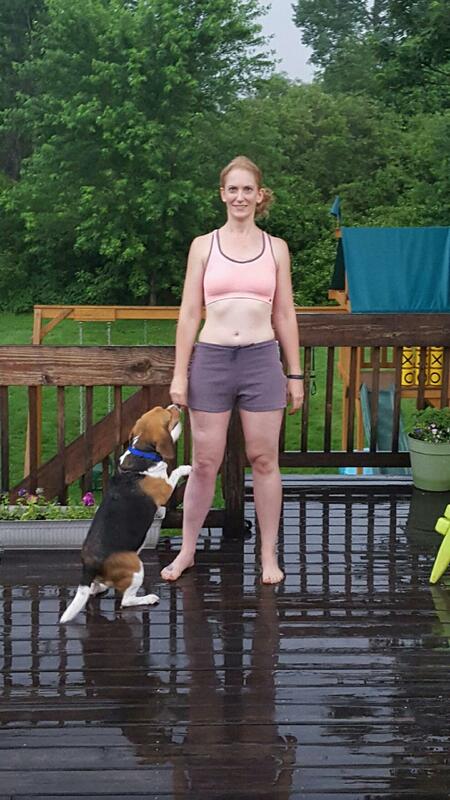 I loved the bootcamp class at the gym, and I have a dog that could use a little help too! Petey is a great dog; he is a full blooded beagle. 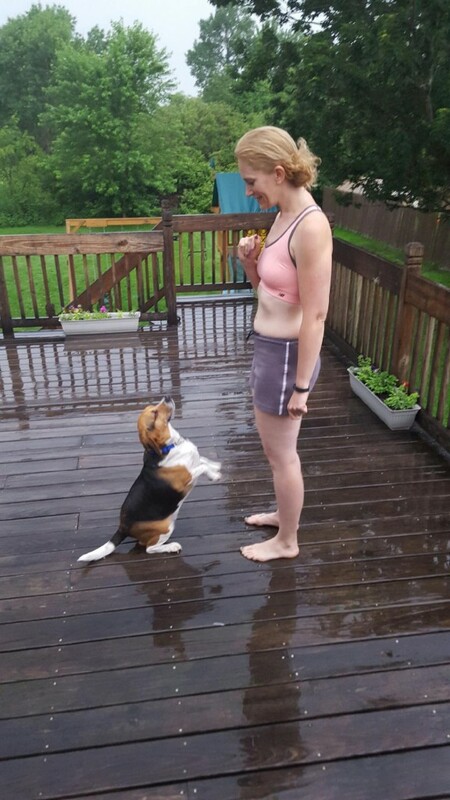 My husband had his eye on this beagle at the Trumbull County Pound for a few weeks, but with the pounds hours and our work schedules, we could just never make it down there to see him. Then one day he called me from the Youngstown Airport and told me he was there, and the beagle from the pound, along with others dogs from the pound where there to be loaded on a plane and taken to a no kill shelter. Unfortunately, not all the dogs were going to fit on the plane, one dog was going to have to stay behind, and most likely was going to be euthanized. Fortunately my husband was there, and Petey was the dog that didn’t make it on the plane. He adopted him right then and there and brought him home! He has made a great addition to our home; however we have really never spent any time training him. I was pregnant with our daughter when we adopted Petey, and she was born shortly after, which meant not as much time for doggy training. We do not have any history of our little guy prior to the pound, but we do know that he has high anxiety. He pants and shakes during storms, and barks at anyone or anything that comes anywhere near the house, even if they are on the street and allowed to be there. I have never been able to take him for a walk without him pulling and tugging so hard I feel exhausted when we return to the house. Petey however is a true lover dog, he just wants to be close to you, snuggled in where he knows he is safe. He has a great bond with our little one too! The goal I have for myself is to continue along my wellness journey! I still have a ways to go to be in the physical shape I would like to be, and then continue to challenge myself moving forward. The goals I have for Petey are endless! To start working through his Anxiety, being able to take him on a walk with the family, reducing his anxiety and overall just making him an even happier healthier dog. Petey has put on a “few” pounds in the last several years due to the lack of exercise overall in our home. I LOVE bootcamp so far! Getting up in the morning and leaving the house with Petey in toe has been so much fun. We get to workout with other dog lovers, and I don’t feel bad when I am tired later in the day and feel like I should have taken him for a walk. Petey sleeps all day following bootcamp! ThankDog! Bootcamp has saved me from getting bored, there is a mix up of exercises every day during the week, so no two days are the same. The cardio is great, as it keeps you moving, thinking about your dog and having a great time. The hardest thing so far has been Petey’s anxiety, and working with Jill and Petey to make the environment something that Petey can come to love as well. He gets excited to get in the car and go, he never hesitates, but we are still working with him to relax and enjoy the time at bootcamp. I will absolutely continue coming to bootcamp, as long as Jill will take us and work with us! ☺ I get a great workout, Petey gets great exercise and we are having a blast! Working out should be fun, it’s what keeps you going, and ThankDog! is a tough workout that leaves you sore the next day, all while having a great time!